If you’re looking for the best living experience on NAU’s campus, then you’ve found it at the International House. The International House community is located in the Campus Heights Apartments, a Northern Arizona University residence hall. Located on central campus, Campus Heights puts you in the middle of NAU life. Room rates, contract information, billing details, and other regulations at the International House follow Housing and Residence Life official policy. Learn more about these and more general information from the Office of Housing and Residence Life. 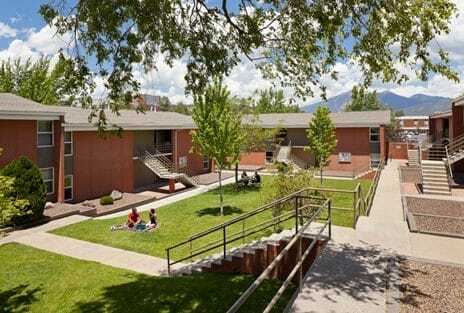 The NAU International House is situated in the vibrant mountain city of Flagstaff. Besides everything there is to do at the I-House and on the NAU campus, there are also many great attractions in the Flagstaff area. Arizona Snowbowl is the state’s premier ski resort. Check out our video about Snowbowl! Historic Downtown Flagstaff is the city’s center for art and nightlife, and is the site for many Flagstaff events, including The Dew Downtown. Lowell Observatory is the home of the Discovery Channel telescope and is the site where Percival Lowell discovered (the former planet) Pluto. Harkins Theatres is the movie theater in Flagstaff and shows all major new releases. Jay Lively Activity Center is Flagstaff’s ice rink; you can ice skate year round. Lava River Cave is an underground cave carved out by lava just outside of town. It makes for a great hike. Sunset Crater Volcano National Monument is an extinct volcano on the outskirts of town. It’s a great place to hike and camp. Museum of Northern Arizona features archaeological artifacts and dinosaur bones. Grand Canyon National Park is one of the 8 Wonders of the World. It is a one and a half hour drive from Flagstaff. Check out our video about the Grand Canyon! Las Vegas, Nevada is only a four hour drive from Flagstaff and features casinos and world-class shows. Phoenix, Arizona is a two hour drive from Flagstaff and is a great site for shopping, entertainment, and going to sporting events.